today, curt and i preview the national league east division. check out our preview of the national league central, here. This is a tough division to figure. The D-Backs won 94 games last year but vastly outperformed their pythagorean expectation. I actually think they could get better this year but win less games, if that makes any sense at all. 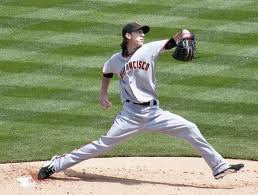 The Giants are still good, buoyed by pitching they wont need much on the offensive side to get in to the playoffs. Madison Bumgarner is for real. A big return of Buster Posey, and some playing time for Brandon Belt could let the Giants cruise into the playoffs. The Rockies are a real unknown but could suprise. They've got a lot of talent but would need things to break perfectly. The Dodgers have the best pitcher in the NL and a superstar in Matt Kemp, and are good enough to stay competitive. Plus they are worth $2.15 billion, so they got that going for them. Lets just call it $26M/win and move on. Bumgarner is definitely for real. After suffering through a horrendous 2010 minor league season in which he lost his velocity and was no longer considered to be an upper echelon prospect, he regained his status as an elite pitcher last year with a great 2011 campaign. matt cain is in a contract year and tim lincecum is still a top 5 pitcher in the nl. a middle of the order of sandoval, posey and belt would go a long way to a division title, if belt is given the green light. i'm not sure why curt has the rockies in 4th place unless he just thinks the top 4 teams are that close. the pitching staff is not great, but has good upside with chacin, nicasio and possibly pomeranz. the additions of scutaro and cuddyer should help bolster the offense around studs, car-go and tulowitzki. the diamondbacks, as curt implied, overperformed last year with luck on their side. and that's relying on purely their run differential. but if you look deeper, their run differential was every more luck-aided which says to me that they got double lucky (1st getting to that run differential and 2nd getting to that win total). i see regressions from hudson, kennedy and cahill as well as from chris young, montero and kubel. i love justin upton but i don't see the eventual mvp type that everyone else does.